Home Scandal and Gossip Is he right? Val Kilmer calls Anthony Bourdain suicide death selfish. 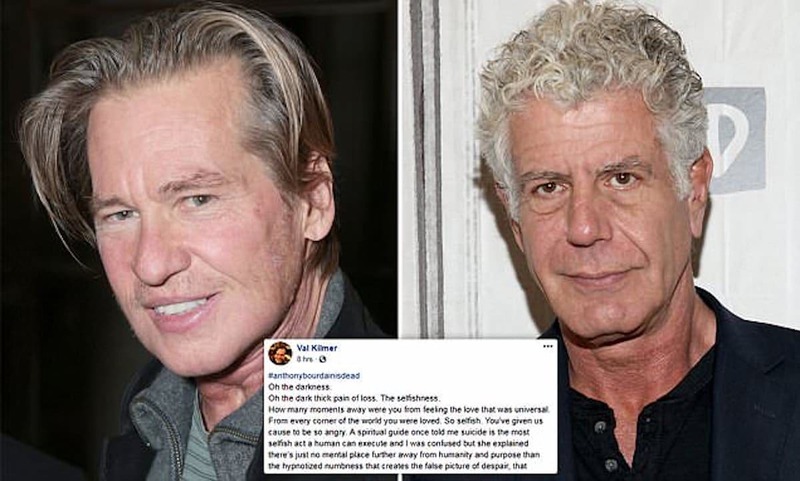 Val Kilmer Anthony Bourdain suicide selfish post leads to divided responses. Val Kilmer Anthony Bourdain suicide selfish Facebook post leads to divided responses. Was the CNN Parts Unknown celebrity chef selfish to take his own life? Hollywood actor Val Kilmer has caused disconcert after posting on social media, Anthony Bourdain was selfish to have taken his own life. In a lengthy and ‘controversial’ post Kilmer accused the celebrity chef of having committed suicide because he was unable to accept love. Posted the actor in part on Facebook: ‘How many moments away were you from feeling the love that was universal’. But the 58 year old actor who has been struggling with his own mortality and bouts with throat cancer didn’t stop there. Which is to wonder, perhaps Kilmer does have a point, that one is obliged to put up with life and be there for it. While others would counter that responding logically to a disease, especially depression is counter logical by very definition and defies straight forward explanation and then again perhaps, irrespective of his presumably well meaning diatribe, Kilmer should have simply chosen his words more carefully especially as many are mourning…. And then there were these reactions on social media that caught this author’s eye. See what you think? While April Star Davis refused to hold back, posting, ‘Wow just wow it’s attitudes like this that make having this invisible illness deadly! Selfish you have no clue what it’s like then to have this illness and be in a place so dark and desperate that you feel the world would be better off without you in it! I regret going to your art show and wish you could refund my purchase as I’m disgusted by every word here! We do NOT think for a minute if everything in the body can be affected by illness then why is it so hard to believe the brain can’t?